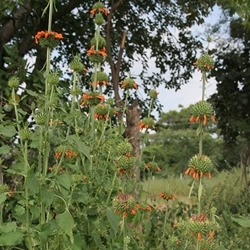 This dried Leonotis nepetifolia Wild Dagga is grown on a small, private farm, without the use of pesticides of any kind. This is the much sought after "Klip Dagga" strain, reportedly the strongest of all the strains. Since we adore this plant so much here at the shop, we decided to do some independent testing on the different strains to see what we came up with. In terms of leonurine content, it was confirmed that Klip Dagga and Dagga Flowers do indeed have the highest concentration of that particular alkaloid. One thing to remember, though, is that just becuase there is a higher concentration of a single alkaloid in a plant, it doesn't mean that other strains which contain leonurine, such as Leonotus Leonurus, Motherwort, and Marihuanilla) are less effective; each herb has become reknown for its own unique effects, and Wild Dagga is no exception. This Klip Dagga is wonderful as a tea on its own, or as an enhancer for your favorite smoking herbs, maximixing their strength and effects, while using less of everything overall. One thing to remember, though, is that just becuase there is a higher concentration of a single alkaloid in a plant, it doesn't mean that other strains which contain leonurine, such as Leonotus Leonurus, Motherwort, and Marihuanilla) are less effective; each herb has become reknown for its own unique effects, and Wild Dagga is no exception. This Klip Dagga is wonderful as a tea on its own, or as an enhancerr for your favorite smoking herbs, maximixing their strength and effects, while using less of everything overall. Do not drive or operate machinery when under the influence of Wild Dagga.